This is a rectangular Firestone Conroy Motor Co. porcelain sign. 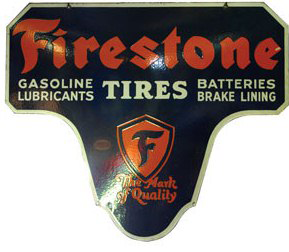 This particular Firestone Conroy Motor Co. sign is blue with orange and white text. It reads, “Conroy Motor Co. Firestone, Most Miles per Dollar” and features a thin white border.